I’ve said it once and I’ll say it again, an author does much more than just write. In fact understanding this was my biggest learning curve once I penned my John Hancock on my first contract. You are a writer, editor, marketer, publicist, your own biggest cheerleader, and your own worst critic. Not to mention the fact that you have multiple voices talking to you at one time as you write. Don’t worry…that’s normal. Kind of. This year, I added “party planner” to my growing writing resume as I prepared for the release of Shadowed just two short months ago. When Shaken released in 2014, my friends planned a sweet party to celebrate. This year, it was my turn to grab the wheel. Only I had no idea where to begin! But like all things in this writing journey, the learning curve is steep, the lessons memorable, and the end result rewarding. The release party doesn’t have to be stressful! Here are some tips I picked up along the way. I planned two different parties with the help of loved ones. I wanted to theme the parties, so I selected decorations and small touches according to the audience. Since some of the major moments in Shadowed are centered around sunsets and the ocean and an opening scene with fireworks, I found decorations that flowed like water and paper décor that resembled the pop of color bursting in a dark sky. It was a fun way to set the stage. For the second party, we decided to go with simple and elegant to fit the audience coming. We chose a room lined with windows overlooking downtown, decorated a center table with roses, set up a sidebar with refreshments, and left an open space for mingling and signing books. I still didn’t pull this off on my own. In fact, I had a moment where I almost threw in the towel. But friends and family came to the rescue. Friends volunteered to bring refreshments and plastic ware that fit the beach theme. Others donated door prizes like Fossil watches and a hand-lettered quote from Shadowed framed beautifully. 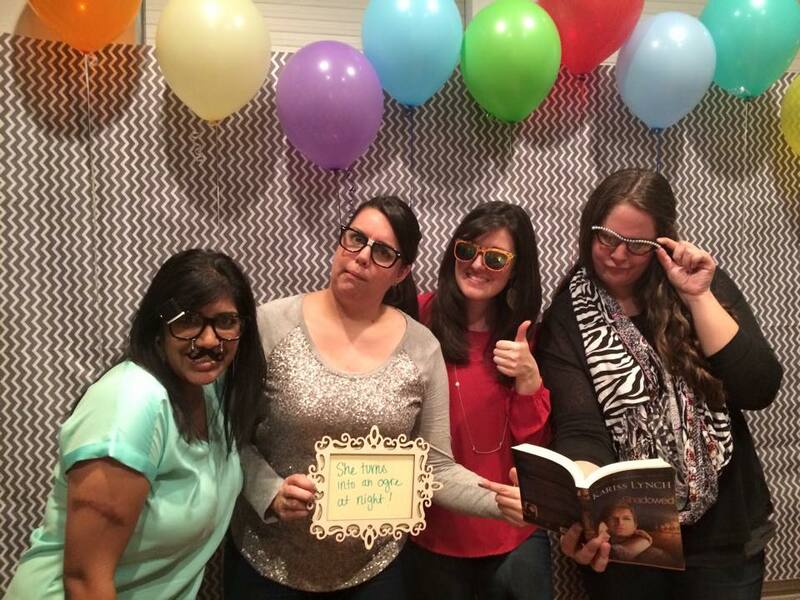 Another friend set up a photo booth complete with reading glasses and chalkboards that represented different plot twists. Party-goers could grab their favorite pair of reading glasses, a chalkboard with their favorite plot twist, and enact the scene on camera. Don’t forget to hit pause in the craziness and excitement and remember. Remember from whence you’ve come. Remember the winding road that led you to this point, the road that seemed to never end and had too many bumps to identify. Remember that writing is your calling. Remember the One who gave you the story in the first place. Bask in the joy of completion, of your baby entering the wide, wide world. Ask a couple of your confidants to keep an eye on the refreshments and remind people to turn in their tickets for door prizes, then cut loose and celebrate. Share your heart, speak of the journey, talk about the story, smile, laugh, sell books, giveaway a few, and praise God for the gift of completion, of release day, and all He taught you along the way. When all is said and done, clean up, sleep up, then hit the desk. You’ve got another manuscript to finish. This entry was posted in Fiction, Marketing and Promotion, Publishing, Writer's Life and tagged book release party, encouragement for writers, Kariss Lynch, Marketing and Promotion, platform building, publishing, Writer's Life, writing advice by Kariss Lynch. Bookmark the permalink.